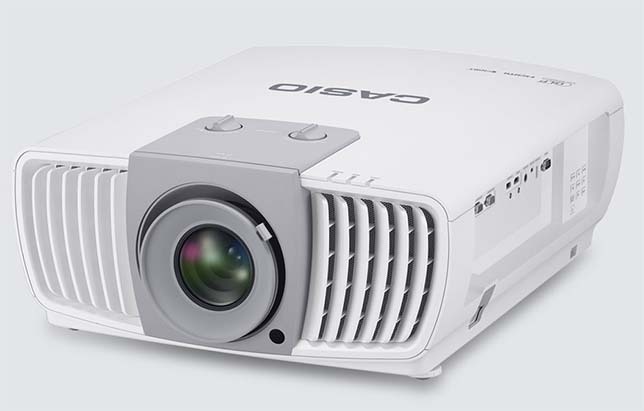 Casio's XJ-L8300HN, a 4K, ultra HD, 5,000-lumen projector. Casio America, Inc. is releasing a new 4K, ultra HD, 5,000-lumen projector in June. The lamp-free projector, XJ-L8300HN, will offer resolution of 3840 x 2160 pixels, with crystal clear projection even on the big screens commonly used in large conference rooms and halls, the company said in a news release. With this new product, Casio enters the market for high-resolution, high-brightness business and education projectors — a market which is expected to grow rapidly by 2020. The XJ-L8300HN will come equipped with a 4K DLP chip, a lens shift function to correct for projector position and a super resolution feature that enhances the signal of low-resolution movies and images. It is expected to deliver an estimated 20,000 hours of projection while avoiding the use of mercury, eliminating concerns for the proper disposal of used lamps and mercury pollution. Casio is also releasing this month two new projectors in its Ultra Short Throw series — the XJ-UT351W and the XJ-UT351WN. With an output of up to 3,500 lumens, the devices are brighter than the previous models and can generate large images over a very short projection distance with a ratio of 0.28:1. The projectors utilize Quick Start technology, meaning they’re ready to use and reach their full brightness within as little as five seconds. Another advantage for teachers when using the XJ-UT351WN with its optional wireless adaptor, the company said, is the C-Assist app (available for iOS and Android), which allows the teacher to control the projector wirelessly from a smartphone or tablet. From the teacher’s desk or anywhere else in the classroom, presentations can be wirelessly displayed over a large area via the projector. The XJ-UT351WN can be integrated into a school’s network, allowing students direct access to the projector to present their findings. All models from the UST series can be installed in conjunction with an interactive whiteboard, allowing teachers and students plenty of interactivity. Like all Casio projectors since 2010, the new UST models also feature the mercury-free laser and LED hybrid light source developed by Casio, which as a service life of up to 20,000 hours without the need to change a lamp. In schools, this corresponds to an operating lifetime of up to 18 years, during which the projector is running for an average of six hours per day during a 180-day school year. With the Eco mode, users may be able to save up to 50 percent on energy costs compared to conventional projectors with mercury-vapor lamps, the company said. For more information on Casio’s lamp-free projectors, visit CasioLampFree.com.